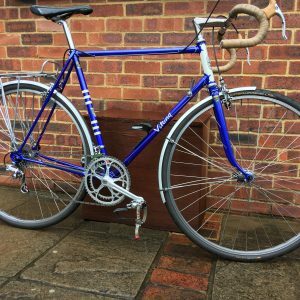 Many thanks again for renovating my 1960 Viking Severn Valley 531 frame. 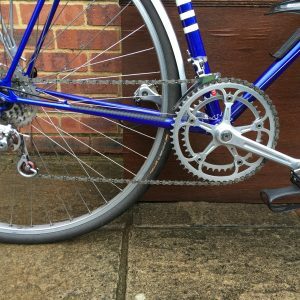 I have now rebuilt the bike – see attached pics – the original components are long gone and I set up the current configuration in the early 1980’s: Specialized/Super Champion 27′ wheels; Campagnolo Super Record chainset (Mavic BB), brakes, headset, Ti piste pedals and seat pillar; Flite Ti saddle, Cinelli Ti Grammo stem/Top 64 bars, Shimano Dura Ace friction shifters (6 speed) and front mech; Sun Tour Cyclone GT rear mech; Jim Blackburn rear carrier and SKS mudguards. Just completed a test ride and its all running well and looks great. Many thanks again.